The arrival of three new 270 foot-tall Super Post-Panamax cranes to Port Houston’s Bayport Container Terminal on Tuesday highlights $100 million in terminal investments. The three neo-panamax ship-to-shore (STS) cranes were the first of two crane shipments Port Houston received this week. Five rubber-tired-gantry (RTG) cranes were delivered Wednesday. Port Houston is the largest container port on the U.S. Gulf of Mexico, handling nearly 70 percent of all containers moving through the gulf. Considerable strategic investment is being made by Port Houston in response to the steady growth it is experiencing. The new cranes at Bayport and construction of Bayport Wharf #2 are a part of its program to increase capacity, cargo-handling efficiency and support the port’s infrastructure. The port’s newest ship-to-shore cranes will be the largest cranes in Texas, standing nearly 30 stories tall with a boom length of 211 ft. able to load and unload vessels up to 22 containers wide. The newest STS cranes cost about $35 million and the RTG cranes cost a little more than $2 million each. Construction of Bayport’s Wharf #2 is an estimated $35 million project. Bayport Container Terminal recently recorded the largest number of single-vessel container box lifts in its history, with more than 4,800 lifts performed during one vessel operation. Further demonstrating its commitment to strategic investment, the Port Commission of the Port of Houston Authority recently awarded a $49 million construction contract for Container Yard 7 at the Bayport Terminal. This new construction will add 50 additional acres of container yard storage area. 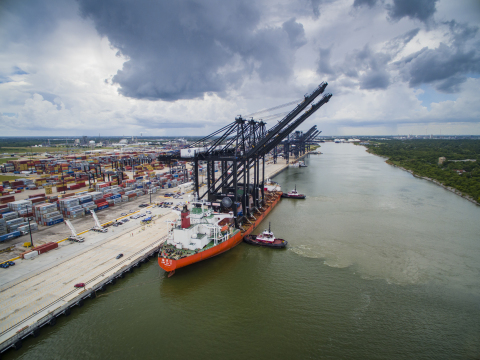 The three newest STS cranes will bring to a total number of 26 ship-to-shore cranes operational cranes working at Port Houston’s Bayport and Barbours Cut Container Terminals, 13 of which are super post-panamax. The five new RTGs are part of an order of 10 cranes. The next five RTGs are scheduled to arrive sometime in September.